Hypothyroidism is one of the most frequent endocrine disorders in India. The most common symptoms include lethargy, depression, and weight gain. 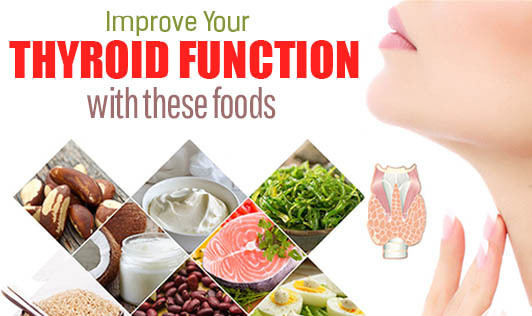 It has been recently found that many natural foods help you improve thyroid function. Some of these include bromealin, ashwagandha, vitamin A, selenium, zinc, and manganese. People with thyroid disorders are prone to increased inflammation in the body, especially in case of auto-immune thyroid disorders. Bromelain, a proteolytic enzyme found in pineapple reduces this inflammatory stress in the body. It works by modulating or coordinating the activity of inflammatory complexes. They work just like a lock and key and are known to have an affinity for inflammatory cytokines such as TNF (Tumor Necrosis Factor) and CRP (C-reactive protein). This ancient medicinal herb has been known to have a stimulatory effect on both T3 and T4 hormone synthesis. Oxidative stress and a sluggish liver are known to alter thyroid metabolism. Ashwagandha improves liver function and boosts antioxidants such as superoxide dismutase in the body. It also helps to stabilize blood sugar and cortisol levels. It is seen that high cortisol levels negatively affects the pituitary gland which in turn suppresses T4-T3 conversion and increases the inactive rT3. So, basically ashwagandha improves TSH, T4, and T3 levels, modulates blood sugar levels, and reduces inflammation in the body. Found in green leafy vegetables and yellow-orange fruits and veggies, vitamin A plays an important role in thyroid function. Vitamin A is required to activate nuclear transcription of thyroid hormone. Selenium is a major cofactor for the enzyme 5' deiodinase, a key enzyme which converts T4 to T3. It is known to reduce inactive rT3 levels and improve active T3 status. It also reduces anti-thyroid antibody formation. Studies have proved that individuals with lower selenium levels are at a higher risk of low T3 levels. Foods rich in selenium include: nuts, mushrooms, salmon, tuna, and sunflower seeds. Zinc reduces thyroid antibodies and is a co-factor for the enzyme 5'deiodinase. Studies have shown that individuals with low zinc levels are also at a higher risk of having low T3 levels. Foods rich in selenium include nuts, green leafy vegetables, fish, pumpkin seeds, flaxseeds, mushroom, and cocoa. Manganese is responsible for the proper function of numerous enzymes, in addition to that of the thyroid hormone. It also plays an important role in driving reactive oxygen out of the body. This is particularly essential for people with thyroid problems as they are known to have higher levels of oxidative stress. Foods rich in manganese include whole grain cereals, legumes, fruits and vegetables, seeds like sunflower, pumpkin, flaxseeds, wheat germ, and garlic.